It's common to have iMessage conversations with the same person through two or more different "contacts". I often have texts with my husband through iMessage and SMS with his iPhone phone number, and then more texts with two of his iMessage email addresses! If you want to combine messages in chronological order, you can select the various contacts you want to combine and Decipher TextMessage will show you the merged conversation ordering the SMS/MMS/iMessages appropriately by date and time. Hold down the Command key (Mac) or the Ctrl key (Windows). Click on the contacts or group chats you want to combine. In the right side of the Decipher TextMessage window, you'll see your combined text message conversations ordered by date and time. Each message is labeled with both the sender and the receiver. 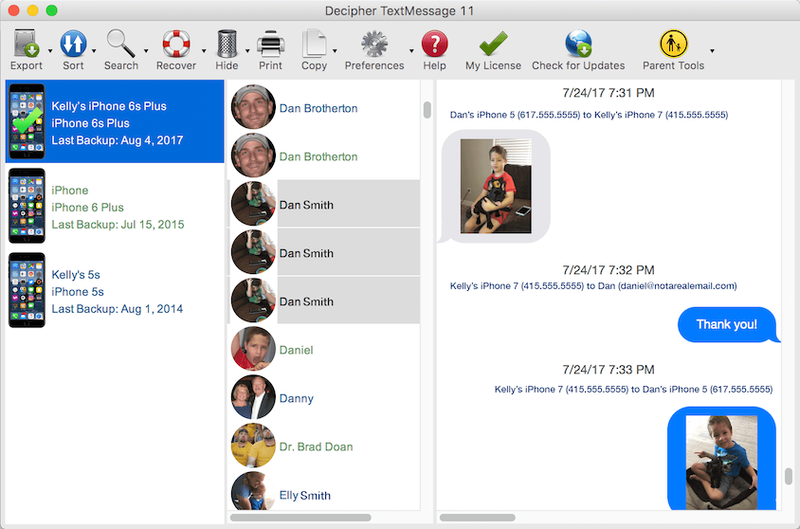 You can combine message history of single contacts or group chats, and SMS messages and iMessages.